SEATTLE - Astronomers have mapped the positions of vast, invisible isles of dark matter in the sky, within which normal "bright" matter galaxies are embedded like glittering gems. The three-dimensional map [image] spans not only space, but also time, and stretches back to when the universe was only about half its present age. Dark matter is a mysterious hypothetical substance [image] that is thought not to interact with light photons and is thus invisible to current detection instruments. This version of SPACE.com's weekly Mystery Monday series comes a day early as part of a bevy of discoveries being reported at the 209th American Astronomical Society meeting in Seattle. SPACE.com's Ker Than will report from Seattle all week. Scientists first invoked the concept in the 1930s to explain why fast-spinning galaxies with relatively little mass don't break apart. The unusual solution: They contain a large amount of invisible matter whose heft and gravity hold the galaxies together. Scientists have since estimated that only about one-sixth of the matter in the universe is visible, and that the rest is dark matter. Some of the strongest evidence for dark matter's existence was announced last year, and even that was highly debated. Even though dark matter can't be seen directly, some scientists say its presence and distribution in the universe can be observed indirectly by the way its gravity distorts the light of distant galaxies streaming toward us. "We look at galaxies which are behind the dark matter that we're interested in," explained study team member Richard Massey of Caltech. "The light from these distant galaxies doesn't travel in a straight line because space itself is distorted and bent, and the light follows that distortion." Massey likens this indirect technique, called "gravitational lensing," to peering at a page of text with a magnifying glass. "The first thing you notice is that the text is bigger, but also, if you look around the edges of the magnifying glass, the text is slightly distorted," he said. "You can investigate the properties of the magnifying glass by observing these distortions and actually find out what shape the glass lens is." The researchers took an analogous approach to create their dark matter map. By analyzing the distortions in galaxy shapes, they inferred properties of the dark matter "lens" itself, including its mass and position in the sky. The new map, created using data collected by the Hubble Space Telescope's Cosmic Evolution Survey (COSMOS), confirms what previous, smaller, maps have hinted at: Dark matter is distributed across the universe in thick clumps and fat filaments within which galaxies are anchored like set jewels. The map relied on data collected from more than half a million galaxies and spans a swath of the night sky that is nearly nine times the diameter of the full Moon. The map is detailed online in the journal Nature and was presented here Sunday at the 209th meeting of the American Astronomical Society. "We've seen the first glimpse of the cosmic web which acts as the basic framework for large scale structures," said study team member Richard Ellis of Caltech. "This has been a prediction of the numerical simulations for many, many years." "The point of it is that it's huge," Massey told SPACE.com. "Now we can really see a representative chunk of the universe. It's new in that we see the big picture." The map also shows how the structure of dark matter has evolved through time. The researchers split the galaxies they observed into three groups, or "shells," depending on how far away they were from us. They determined distance by the amount of "redshift" observed in the galaxies' light. As the universe expands and stars and galaxies continue to race away from us, the wavelength of light they emit stretches and becomes slightly redder. Because distance and time are closely linked in cosmology, the higher an object's redshift, the younger and smaller the universe was when the light was first emitted. In the survey, light from galaxies in the shell furthest from Earth corresponded to a time when the universe was only 6.5 billion years old, or roughly half its present estimated age. This ancient light had to travel farther-and through more dark matter-than light from galaxies in the nearest shell. 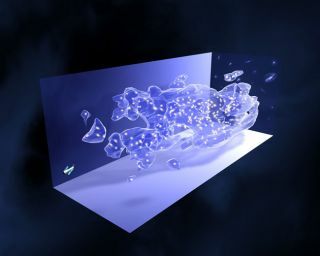 By combining data from all three shells [image], the researchers created a three-dimensional map of the shape and position of dark matter in the sky. The new map reveals that as time passed, from the early universe to the more recent universe, dark matter became clumpier and less filamentary. This agrees with some current theories which state that the universe transitioned from a state in which matter-regular and dark-was relatively smoothly distributed to its current state, in which matter is more concentrated in some places than others. It is in these areas of high matter concentration that stars, galaxies and galaxy clusters reside. According to those same theories, dark matter began to coalesce into larger structures a little before normal matter did. "It collapsed first into these filaments and clusters and provided the gravitational scaffolding into which normal matter-galaxies, planets, us-flowed," Massey said. "It's only because there's a lot of dark matter and it collapsed first that we can exist at all." The new map is expected to help scientists answer one of the central problems in cosmology: What is dark matter? "We eventually want to know what it is, but the first step is to figure out where it is," Massey said. Not everyone is convinced that the new map reveals the presence of dark matter. Some skeptics think there is a good reason dark matter is invisible: It doesn't exist. According to these scientists, an alternative explanation for the universe's mass discrepancy is that gravity does not operate equally in all parts of the universe, as is predicted by Newton and Einstein. "The authors here converted their observed wiggles into matter density using Einsteinian formula," said HongSheng Zhao, a researcher at the University of St. Andrews in the UK, about the new map. "If we take a different formula, we would get somewhat different densities or clumps." Zhao is an advocate of a theory of modified gravity called TeVeS, in which gravity is stronger in certain regions of space than others. In these gravity-boosted regions, gravitational lensing would work differently. Until a dedicated mission is launched to measure the law of gravity in weak gravity environments, far away from the influence of the Sun and planets, such possibilities cannot be ruled out, Zhao said in an email interview. "If the law does have a factor depending on the environment, then it could explain away much of dark matter," he said. Massey concedes that deviations in the law of gravity across the universe is still a possibility, but says that there is now too much evidence to dismiss dark matter's existence. "No matter what you do, there really has to be some dark matter to match up with all the gravitational lensing measurements," he said. "Of course, there could also be deviations from general relativity on top of that, but the evidence is now piling up that dark matter makes up at least some of this missing mass." Editor's Note: All week, SPACE.com is providing complete coverage of the 209th meeting of the American Astronomical Society.